When Summer comes around, I crave lighter foods, but often have a tough time listening to my body and am instead stuck in the Winter ritual of having a hefty evening meal that I may or may not even be hungry for. So, usually, I make the transition to lighter foods my putting together hefty soups that are devoid of the usual suspects – milk, creams, or white flour/butter-based roux – and instead focus on vegetables, healthy grains, and greens. 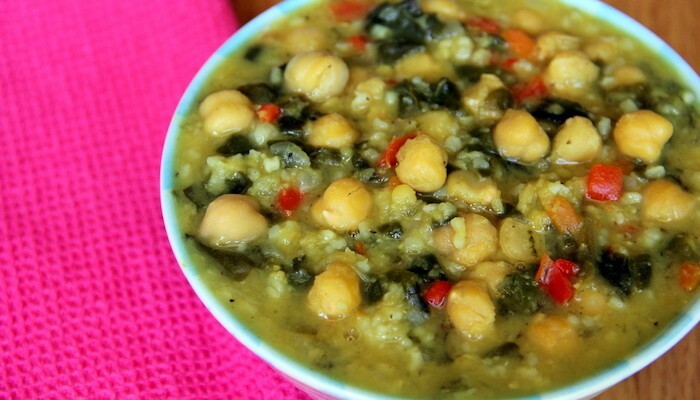 The following recipe for a curry lentil soup is more than just that – it includes Swiss chard, red pepper, and chickpeas to round out the nutrition and texture. You’ll love it, walking away both full and light! Enjoy. 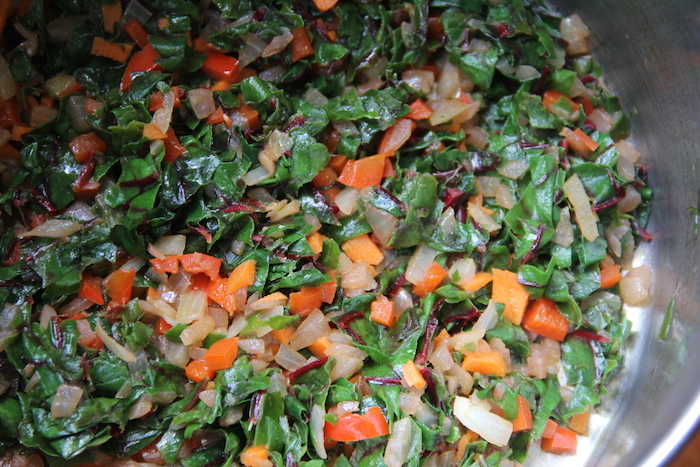 Swiss Chard: is most popular in Mediterranean cuisine but is found almost everywhere. It is an excellent source of vitamins K, A and C and is a great source of magnesium, potassium, iron and fiber. It contains just 35 calories per cup and provides 300% of the daily value of vitamin K in the same serving. It contains oxalates, however, which can decrease the body’s absorption of calcium and lead to kidney stones. That’s why it is important to rotate your greens and not just focus on one, including Swiss chard, each and every day. Add the olive oil to a pot heated to medium-high. Add carrot, onion, and red bell pepper. Cook for 2-3 minutes. 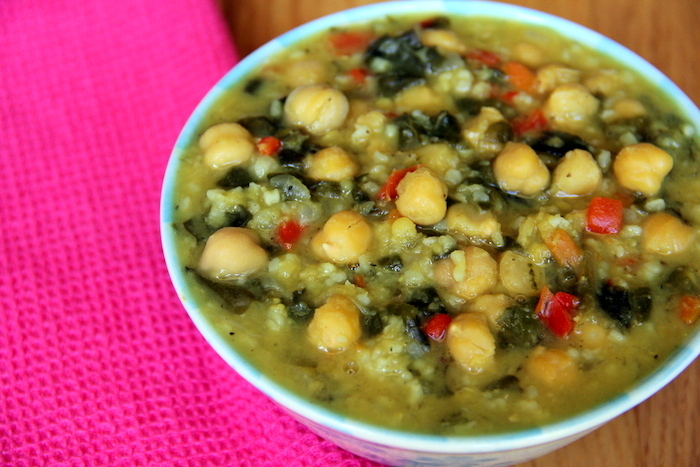 Add the chard and cook for another 2-3 minutes, then add the lentils, bulgur, chickpeas, garlic, soy sauce, curry, salt, pepper and cumin. Mix for a few minutes until evenly combined and then pour in 6 cups of water. 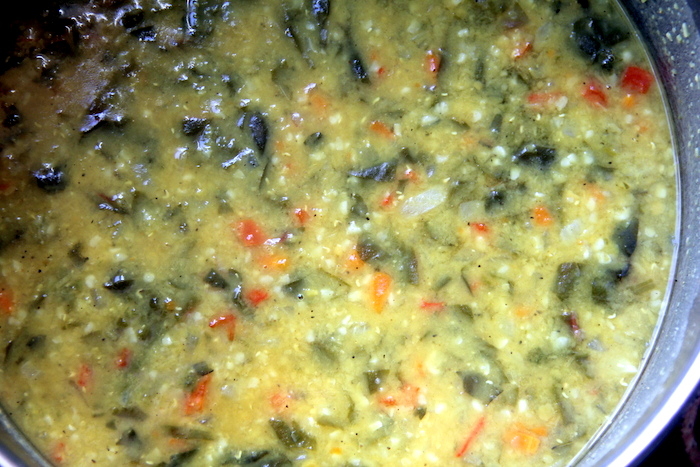 Bring the mixture to a boil and then reduce heat to a simmer and close the pot with a lid. 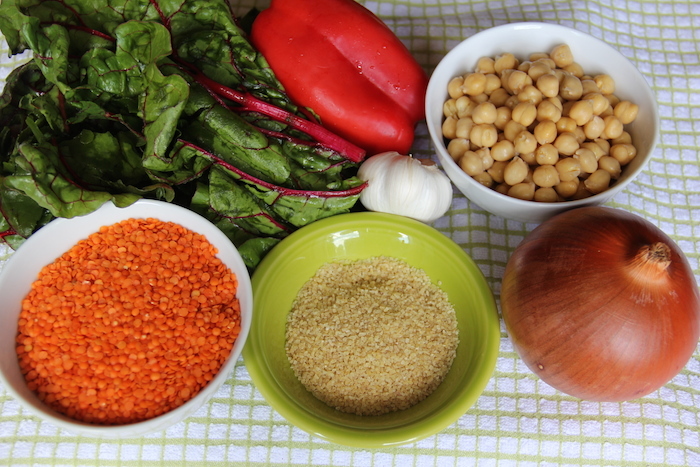 Simmer for 30 to 45 minutes until the grains, chickpeas and vegetables are adequately cooked through. 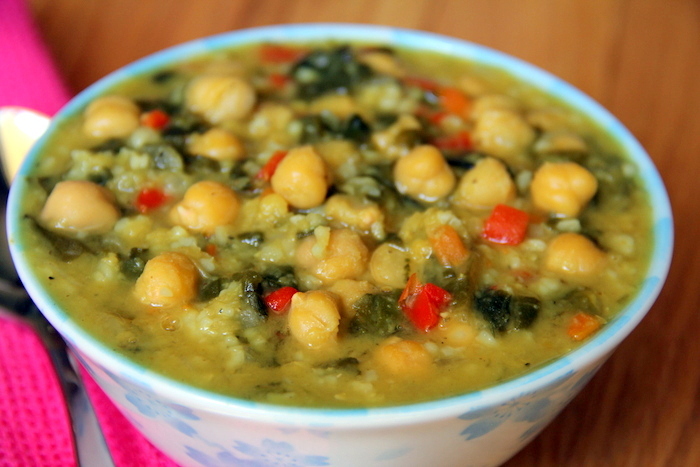 This entry was tagged chickpea soup, chickpeas, curried lentil soup, curry lentil soup, curry recipe, curry soup, detox recipes, easy healthy recipes, easy lentil soup, easy soup recipes, going vegan, good vegetarian recipes, great vegetarian recipes, healthy, healthy breakfast recipes, healthy dinner recipes, healthy food recipes, healthy recipes, healthy soup recipes, heart healthy recipes, how to become a vegetarian, how to make lentil soup, lentil soup, lentil soup recipe, lentil soup recipes, quick vegetarian recipes, red lentil soup, simple vegetarian recipes, soup, soup recipe, soup recipes, soups, soups recipes, vegan, vegan essentials, vegetable soup, vegetable soup recipe, vegetable soup recipes, vegetarian, veggie recipes, what is a vegan, what is vegan. Bookmark the permalink.